The incident / callout pages of this website are probably the best indicators and worth a visit but this page aims to focus on those where the team spends most of it’s time. The black spots link back to specific incidents. If you as a walker or climber got into difficulty in a particular area but managed to get yourself down under your own steam then we would be pleased to hear about it. Please remember that the Team’s website exists to highlight the role of mountain rescue, the risks on the hills and as such, aims to help people like yourself and your friends enjoy the mountains safely. 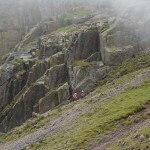 Piers Gill is the deep cut gill which the Corridor Route crosses 200m after leaving Lingmell Col on the descent from the Pike. 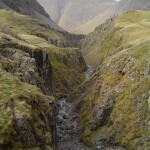 Piers Gill, itself, is a ‘canyon’ descent with several short pitches and one longer one; do not attempt to walk down the bed of the stream!! 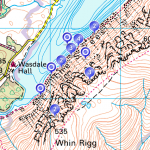 The Wasdale Screes are an area of unstable, loose boulders on the far (east) bank of Wast Water, underneath Illgill Head and Whin Rigg. GR NY 144 038 to NY165 058.